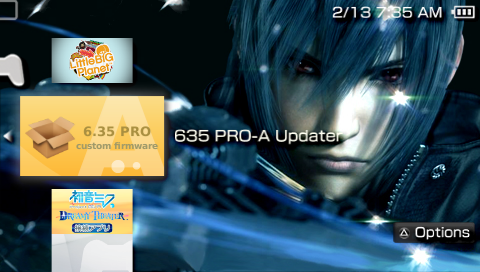 Yep, development on 6.35 Pro-A LCFW is in full steam with another update now available from VFlame aka Liquidzigong. 6.35 Pro-A3 fixes a number of bugs with the LCFW and features a new 6.35 Pro FastRecovery. Do note that unlike 6.35 Pro-A2, you will need to replace the current FastRecovery with the new one due to incompatibilities (ergo the old one doesn’t work with 6.35 Pro-A3). You will need to delete/replace the older files. No need to uninstall 6.35 Pro-A or 6.35 Pro-A2. Thanks to banban for the tip! so i can directly go to PRO-A3 from PRO-A…my english understanding is a little bad…sorry,,,and thank you in advance! Yep you need can upgrade directly from Pro-A. How to install plugins on thiis firmware? update first to 6.20 TN-D . . . . if you have a psp 3000…. SYL ?…. may narinig ka na ba na na.brick psp nia dahil sa pag.install nito ??? Yep. May confirmed brick, pero it was from upgrading from 6.20 TN to 6.35 OFW. san ka ba nka.base ngayun ?… sa pilipinas ba ? bakit mag.hang psp ko ??? . . . pag.maglalaro ako….. after mga 5 minutes… mag.hang na tapos ma.turn off. . . .
do you know whats the problem of this psp ??? ok lang po ba na i-update ko from 5.03 GEN-C to 6.35 PRO-A3? basta wag lng CFW to CFW . . .
tapos install mo lng ang 6.35 PRO-A3 . . . .
hello, could you give me a mirror download link please? thank you. which is better based on game compatability? 6.20 tn-c or 6.35 pro A3? Thanks for the tip. Gonna update and try to test. kuya silverblade …ggana po b e2 sa psp 3003 w/v6.35..kasi nag install ako ng 6.35hen+prometheus iso loader..san po b illgay ung iso folder sa root or sa psp/game/? at mas ok bng gamitin e2ng 6.35 pro-a3? thanks mag ccoment agad ako pag aus n ..kailangan ko b idelete o iso loader and then install ko ung 6.35 pro-b8?